The Narciss was a Russian SLR for 16mm film, made between c.1961 and c.1965 by KMZ. It was styled very much like a 35mm SLR (it is an SLR! ), with an eye-level pentaprism viewfinder. The finder was interchangeable, but it is reported that other finders were never produced. (Not correct - there was a special finder for using the camera, when attached to a microscope). All the body controls were on the top plate - apart from the rewinding; on the left, a film reminder and X- and M- PC flash connectors, on the right the shutter speed dial, shutter release and advance lever, with frame counter in a window in front of the lever. 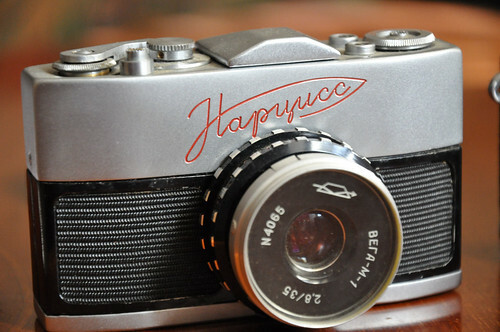 The front had the name engraved in red above the lens; usually in cyrillic - "Нарцисс", but sometimes "NARCISS" in roman capitals (for export models); the spelling "Narziss" is also seen on the instruction manual. Most had chrome tops and black-covered bodies, but there was also a cream covering. The film was supplied in (up to) 24-exposure cassettes, into which it was rewound after use, in the same way as 35mm film. Images were 14x21mm. It was normally fitted with an Industar-60 (Cyrillic: Индустар) or VEGA-M-1 (ВЕГА) 35mm f2.8 lens, which was interchangeable, mounted with a 24mm thread; adaptors were available to fit Zenit 39mm thread lenses. The focal plane shutter ran from 1/2 to 1/500s +B, with X (up to 1/60) and M flash sync. The shutter was cocked by the winding lever, which also returned the mirror to viewing position. The Narciss was possibly the smallest commercially-available SLR, although the Pentax Auto 110 is a strong contender here.